Keep your favourite plant warm this winter. 1.2M x 80cm, so big enough for most plants. Keep your plants frost free and cozy this winter with a warming fleece. This single fleece bag fits comfortably over your favourite plant to keep out the cold and to provide protection against cold and winter frosts. Ideal for protecting a wide range of plants during the winter, this large fleece jacket retains heat so protecting your plants from the worst of the weather. The breathable fabric allows air, moisture & water to reach the plants, while preventing condensation build up. Easy to use, simply place the bag over your plant and pull the drawstring to tighten the opening around the base. 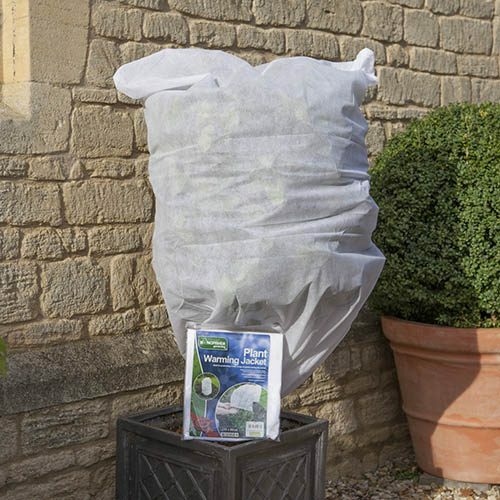 For extra protection, straw can easily be added to the bag around more tender plants and is held in place – so it doesn’t blow all around the garden. Fully re-usable and machine washable, you’ll get many years of usage from your fleece. Plants can be given an extra layer of insulation such as straw, which is then held in place by the fleece bag.